In this inaugural episode of the Brand Focus Podcast we explore the true definition of the term brand. 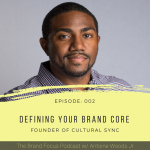 I provide an overview of why I started the Podcast and why I’m qualified to speak on the topics of branding. We review common definitions of the term, provide a breakdown of the factors that equate to a brand, and provide a simple definition of the term.